If you love the way you look wearing a 3 piece suit, have you tried a Vinci Suit. Vinci makes all of their suits for the man who appreciates what a classy Italian style suit looks like. 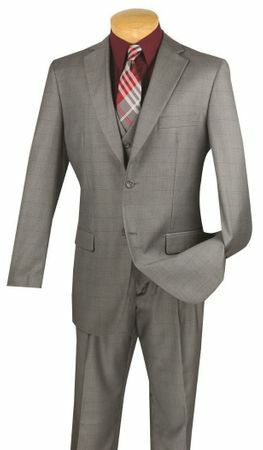 This classy looking gray 3 piece suit has a window pane plaid pattern fabric that has single pleat pants and of course the matching vest making it a 3 piece to begin with. Made of fine wool feel poly/rayon.